Could Donald Trump already be the worst of all American presidents? In less than two years his record on the world scene has been frightening enough: U.S. withdrawal from the Paris Accords, scuttling of the Iran nuclear treaty, moving the U.S. embassy in Israel to Jerusalem, unjustifiably punitive sanctions against Russia, Iran, and Venezuela, terror bombing of Mosul and other Iraq cities, bombastic threats against friends and enemies alike – not to mention a $54 billion gift to the Pentagon and stepped-up nuclear “modernization”. Hard to imagine much worse. One article of faith among liberals and the corporate media is that Trump’s presidency stands alone as a house or horrors, unprecedented in its fascistic authoritarianism, crazy pronouncements, and ideological blend of xenophobia, racism, sexism, and sheer extremism. Those in the “resistance” know that pretty much any alternative (Bill Maher, LeBron James) would be far better, though specifics — beyond Trump’s mortal sin of partnering with Putin — are rarely mentioned. But precisely what alternatives? Bernie Sanders? Well, the Democratic National Committee never gave him much chance. Obvious comparisons are Trump’s predecessor, Barack Obama, and his competitor, Hillary Clinton. Obama was in charge of U.S. foreign policy for the preceding eight years, so his legacy (with plenty of help from Clinton) might be worth considering. Obama, it turns out, was among the most militaristic White House occupants in American history, taking the imperial presidency to new heights. It has been said that Obama was the only president whose administration was enmeshed in multiple wars from beginning to end. His imperial ventures spanned many countries – Afghanistan, Iraq, Syria, Libya, Somalia along with proxy interventions in Yemen and Pakistan. He ordered nearly 100,000 bombs and missiles delivered against defenseless targets, a total greater than that of the more widely-recognized warmonger George W. Bush’s total of 70,000 against five countries. Iraq alone – where U.S. forces were supposed to have been withdrawn – was recipient of 41,000 bombs and missiles along with untold amounts of smaller ordnance. Meanwhile, throughout his presidency Obama conducted hundreds of drone attacks in the Middle East, more than doubling Bush’s total, all run jointly (and covertly) by the CIA and Air Force. Obama engineered two of the most brazen regime-change operations of the postwar era, in Libya (2011) and Ukraine (2014), leaving both nations reduced to a state of ongoing civil war and economic ruin. For the past seven years Libya has been overrun by an assortment of militias, jihadic groups, and local strongmen – predictable result of the U.S./NATO bombing offensive to destroy the secular nationalist (and modernizing) Kadafi regime. This was purportedly Secretary of State Clinton’s biggest moment of glory, her imperialist gloating on full display following Kadafi’s assassination. As this is written conditions in Libya worsen by the day, reports surfacing of hundreds of people killed during violent clashes in the suburbs of Tripoli as rival militias fight for control of the capital. Militias now exercise control over ports, airfields, and much of the oil infrastructure. More tens of thousands of Libyans are being forced from their homes, a development greeted with silence at CNN and kindred media outlets. United Nations spokesperson Stephane Dujarric recently decried this violence, noting the indiscriminate shelling by armed groups killing civilians, including children. Not to be outdone, the U.S. (joined by a few European states) issued a statement condemning the violence in Libya, reading in part: “We urge armed groups to immediately cease all military actions and warn those who tamper with security in Tripoli or elsewhere in Libya that they will be held accountable for any such actions.” How thoughtful of those very military actors who, with U.N. blessing, brought nothing but endless death and destruction to the Libyan people. In Ukraine, as Vladimir Putin was being demonized as the “new Hitler”, real fascists (or at least neo-fascists) were installed in power through the well-planned and generously-funded conspiracy of Obama’s neocon functionaries, led by Victoria Nuland and cheered on by such visiting notables as John McCain, Joe Biden, and John Brennan — all scheming to bring the Kiev regime into the NATO/European Union orbit. The puppet Poroshenko regime has since 2014 been given enough American economic and military largesse to finance its warfare against separatists in the Russian-speaking Donbass region, resulting in more than 10,000 deaths, with no end in sight. Following the gruesome pattern of Libya, Iraq, and Afghanistan, Ukrainian society descends into deepening chaos and violence with no end in sight. It is easy to forget that it was the Obama administration that planned and carried out the first phases of the Mosul operation (begun in October 2016) which produced hundreds of thousands of casualties (with at least 40,000 dead), left a city of two million in Dresden-like state of rubble, and drove nearly a million civilians into exile. The same fate, on smaller scale, was brought to other Sunni-majority cities in Iraq, including Ramadi, Tikrit, and Fallujah (already destroyed by U.S. forces in 2004). Whatever the official goal, and however many secondary collaborators were involved, these were monstrous war crimes by any reckoning. After calling for a nuclear-free world (and receiving a Nobel Peace Prize for that promise), Obama reversed course and embarked on the most ambitious U.S. nuclear upgrading since the early 1950s – the same project inherited by Trump. Speaking in Prague in 2009, the president called for total abolition of nukes, saying “the Cold War has disappeared but thousands of those [nuclear] weapons have not . . . Our efforts to contain these dangers [must be] centered on a global non-proliferation regime.” A laudable objective to be sure. But for a price tag of one trillion dollars (over two decades), Obama decided to create new missile delivery systems, expand the arsenal of tactical warheads, and fund a new cycle of bombers and submarines – all with little political or media notice. These initiatives violated the Nuclear Non-proliferation Treaty prohibiting such moves, while essentially blocking any genuine efforts toward nuclear reduction and nonproliferation. In the months before Obama departed the White House he laid the groundwork for a new, more dangerous, Cold War with Russia. This agenda, negating earlier plans for a “reset” with the Putin government, would be multi-faceted – expanded NATO forces along Russian borders, renewed support for the oligarch Poroshenko in Ukraine, new and harsher economic sanctions, expulsion of diplomats, accelerated cyberwarfare, charges of Russian interference in the 2016 elections. Not only has this strategy, eagerly advanced by the Clintonites and their media allies, brought new levels of insanity to American politics, it has left the two nuclear powers menacingly closer to armed confrontation than even at the peak of the Cold War. Obama’s contributions to a more robust imperial presidency went further. Collaborating with Israel and Saudi Arabia, he stoked the Syrian civil war by lending “rebel” fighters crucial material, logistical, and military aid for what Clinton – anticipating electoral victory – believed would bring yet another cheerful episode of regime change, this one leaving the U.S. face-to-face with the Russians. During his tenure in office, moreover, Obama would deploy more special-ops troops around the globe (to more than 70 countries) than any predecessor. As the 2018 midterm elections approach, Obama has chosen to depart from historical norm and go on the attack against a Trump presidency viewed as signifying all that is evil. A Democratic victory would reject Trump’s “dark vision of the the nation and restore honesty, decency, and lawfulness to the American government”. 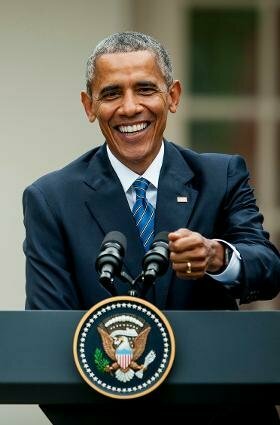 In his first speech Obama said that orchestrated public fear has created conditions “ripe for exploitation by politicians who have no compunction and no shame about tapping into America’s dark history of racial and ethnic and religious division.” Does Obama need to be reminded that such “dark history” also includes militarism and imperialism? Whatever one’s view of the Trump phenomenon in its totality, the amount of death and destruction he has brought to the world does not (yet) come close to Obama’s record of warfare, drone strikes, regime changes, military provocations, and global deployments. If neocon interests have come to shape U.S. foreign policy, those interests have so far been more fully embraced by Obama and the Clintonites than by Trump, despite the scary presence of Trump’s hawkish circle of lieutenants. Unfortunately, Obama’s eight years of imperial aggression elicited strikingly few liberal or progressive voices of dissent across the political and media terrain. He enjoyed nearly complete immunity from protest at a time when even the smallest vestiges of a once-vigorous American antiwar movement had disappeared from the scene. CARL BOGGS is the author of several recent books, including Fascism Old and New (2018), Origins of the WarfareState(2016),andDrugs,Power,andPolitics(2015).Hecanbereachedat ceboggs@nu.edu. With many thanks to: Counterpunch@Counterpunch.org for the original posting.